Fortune Inc. was established in 2000 and are engaged in manufacturing, exporting & supplying a wide assortment of Barcode Stickers, Printed Fabric Labels and Hang Tags. Our product range comprises Garment Hang Tags, Clothing Hang Tags, Cardboard Hang Tags, Fancy Hang Tags, Satin Printed Labels, Taffeta Printed Labels, Cotton Fabric Labels, Barcode Stickers, Price Tickets, Plain Barcode Sticker, Thermal Transfer Ribbon and many more. Keeping in mind the credibility of organization, we manufacture our range using premium quality material. We source the material from reliable industrial vendors, having vast experience in the concerned domain. Therefore, our products are reckoned for their unmatched features such as eco-friendliness, available in different sizes, exquisite colors, water proof, heat resistant and others. 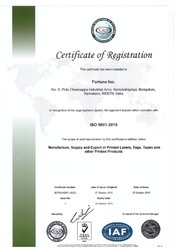 We are certified by OEKO-TEX standard for manufacturing labels and supply products in compliance to that only. Our strict adherence towards quality, ability of making simplicity in dealings and timely solution for clients’ queries has assisted us in placing a remarkable position in this competitive industry. We have commendable proprietor, under whose guiding principles and leadership, we have achieved distinct position in the industry. He support and guide us to provide solutions as per the growing requirements of clients and in turns we have acquired their large support. Our company has established an advanced infrastructural set-up, where we ably and systematically carry out our entire business practices. To speed up our entire business activities, we have partitioned the whole set-up into varied other sections. Our infrastructure comprises production department, quality testing laboratory, sales and marketing unit, warehousing and packaging unit, logistics department and many more. We timely upgrade our infrastructure according to the changes prevailing in the market. In our packaging department, we safely pack our complete range using high grade material, which protect them from external flaw during transit. Under the valuable assistance of our mentor Mr. Madhukar S.	(Proprietor), the company has hired a talented and experienced team of professionals, who assists us in meeting the clients’ specific demands and orders within committed time period. Our team comprises designers, production personnel, quality controllers, administrative experts, sales and marketing personnel, administrative experts, warehousing and packaging personnel and numerous others. Manufacturing, Trading, Importer and Exporter of Hang Tags, Barcode Tags etc. With the aid of our well-equipped infrastructural facility, we have been able to meet the precise needs of our customers in the most efficient manner. Our infrastructure is carefully divided into different units, to ensure that all the on-going processes are carried out in the most streamlined manner. Our infrastructure is known for its large production capacity and is upgraded with latest machinery at regular intervals of time. As our company has been ISO Certified . The assistance and support of our skilled and experienced professionals has helped us in attaining a commendable position in this domain. They are appointed by our management after conducting rigorous selection procedures. Boasting by the management skills, industrial experience and vast knowledge of our professionals, we have been able to attain the precise needs and requirements of our customers. Large production capacity of our infrastructure has helped us in meeting the bulk assignments of the offered labels and tags in the most efficient manner. For the purpose of ensuring the best possible quality of the offered tags and labels, we have appointed a team of skilled quality controllers and established a huge in-house quality testing unit. For the ease of our customers, we accept different modes of payment.